It has been 63 years since Japan's unconditional surrender ended history's most destructive war. On Sept. 2, the Battleship Missouri Memorial will commemorate the anniversary with a ceremony featuring keynote speaker United States Senator Daniel K. Akaka, and guest speaker, U.S. Navy Captain Gregory R. Thomas, Commander, Pearl Harbor Naval Shipyard and Intermediate Maintenance Facility. 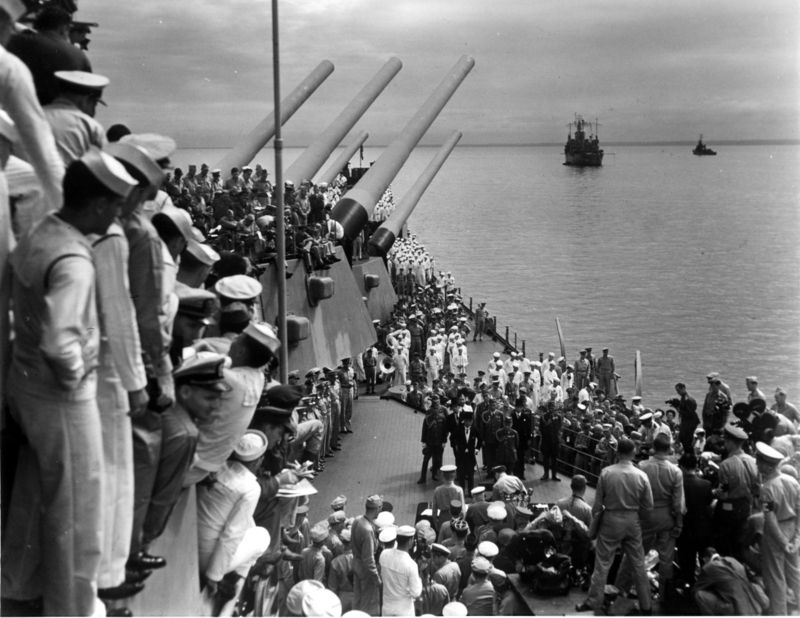 Titled "The End of the War in the Pacific," the annual ceremony will be held from 8:45 to 9:45 a.m. on the Missouri's fantail at the Battleship Missouri Memorial in Pearl Harbor. The ceremony is free and open to the public. 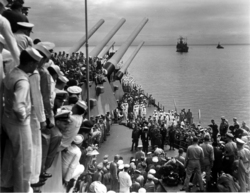 The ceremony will coincide with the time of day that representatives from 10 nations signed the formal Instrument of Surrender on board the USS Missouri (BB-63) in Tokyo Bay on Sept. 2, 1945. Senator Akaka and Capt. Thomas will offer remarks to the hundreds of dignitaries, military personnel, Hawaii residents and visitors anticipated for the ceremony. The program will also feature patriotic music, Color Guard and a traditional military rifle volley salute to those veterans who paid the ultimate sacrifice in defense of freedom. United States Senator Daniel Kahikina Akaka is America's first Senator of Native Hawaiian ancestry, and the only Chinese American member of the United States Senate. During World War II, he served as a civilian worker then in active duty in the U.S. Army Corps of Engineers from 1943 to 1947. Following the war, Senator Akaka pursued a career in education, first as teacher and principal then as an administrator in the State of Hawaii Department of Education. He was elected to the U.S. House in 1976 and appointed to the Senate upon the passing of Senator Spark Matsunaga, winning election to the office in 1990, and has since been re-elected three times. Akaka is Chairman of the Veterans' Affairs Committee, the Armed Services Subcommittee on Readiness and Management, the Energy and Natural Resources Subcommittee on National Parks Historic Preservation and Recreation, and the Homeland Security and Governmental Affairs Subcommittee on Federal Government Management, the Federal Workforce and the District of Columbia. Capt. Gregory R. Thomas, a native of Portsmouth, Virginia, assumed command of Pearl Harbor Naval Shipyard and Intermediate Maintenance Facility in June 2007. A graduate of the United States Naval Academy, Thomas earned his doctorate in Hydrodynamics and Master of Science Degree in Mechanical Engineering at Massachusetts Institute of Technology (MIT). Prior to assuming command of Pearl Harbor Naval Shipyard, Thomas served as Operations Officer at Portsmouth Naval Shipyard. Thomas' awards include Legion of Merit, Meritorious Service Medal (3 awards), Navy Commendation Medal (4 awards) and Navy Achievement Medal. Pearl Harbor Naval Shipyard, which celebrates its Centennial this year, was key to the resurrection of the U.S. Pacific Fleet and our ultimate victory in WWII. It remains vitally important to our national security today. Free shuttle service to the Battleship Missouri Memorial will be available between 7:45 and 8:30 a.m. at the Missouri's shuttle boarding station near the USS Bowfin Submarine Museum and Park. Free return shuttle service will remain available through 5 p.m. For more information, call 423-2263 and press 7 immediately following the greeting or visit http://www.ussmissouri.org. The ex-USS Missouri (BB-63), decommissioned for the final time in 1992, is an American icon and international symbol of peace, officially donated in 1998 by the U.S. Navy to the USS Missouri Memorial Association, Inc., a private Hawaii-based 501(c)(3) non-profit organization whose mission is to create and maintain a fitting memorial to the people and historic events reflecting our nation's legacy of duty, honor, strength, resolve and sacrifice. Maintained and operated as the Battleship Missouri Memorial under the tireless care of the association's staff and volunteers, its continued success as a historic attraction is made possible by the support of visitors, memberships, grants and the generosity of donors. For more information, visit http://www.ussmissouri.org. Media interested in covering this event must RSVP in advance to Keith DeMello at 539-3482 or (cell) 542-5343. Media escorts will depart at 8:15 a.m. Sept. 2 from the USS Bowfin Submarine Museum.